Good Morning my friends, can you believe it's time already for Challenge #5 - Pink Hope Blog Hop for Link Up for Pink? Gosh, where is the time going? Well, lets get on with all the great news and excitment going on here with Link Up for Pink. First of all, here is my creation "Dream" that I have created. I hope you enjoy stopping by and looking at the cards I post here as I thoroughly enjoy creating and posting them so that everyone that is fighting the battle of Breast Cancer and also for those that are by their side, hoping, praying, giving strength and love. This image is"Arelia Fairy" from one of our Super Duper Sponsors, Paper Make Up Stamps You may want to visit their shop as they have digis for all your needs. And since they are sponsoring Challenge #5, if you enter your creation you can win a $15.00 Voucher to their shop. That is a fantastic prize!! So to all the scrappers out there, get your stuff together and enter your card because you may be the next big Winner and I hope to see lots of entries from scrappers I personally know. I am going to be looking for your creations for sure... lol The blog is from August 23rd until September 6th and the winner of the fabby prize will be announched on September 7th. Good luck to all participants. 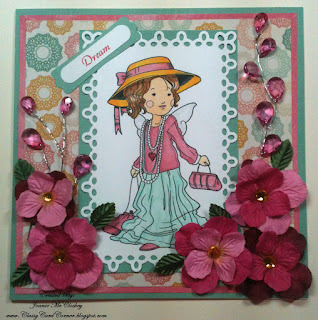 Thanks once again for taking time to stop by and please check out the Link up for Pink - Pink Hope Blog Hop to see all the beautiful cards the design team girls have created. What a beautiful card Joanie! Love how this turned out! Your embellishments are simply divine!!!! Gorgeous card!